Time to return to this prior favorite. We were bumped out of SalesForce a couple weeks ago and now they are starting to rally again. 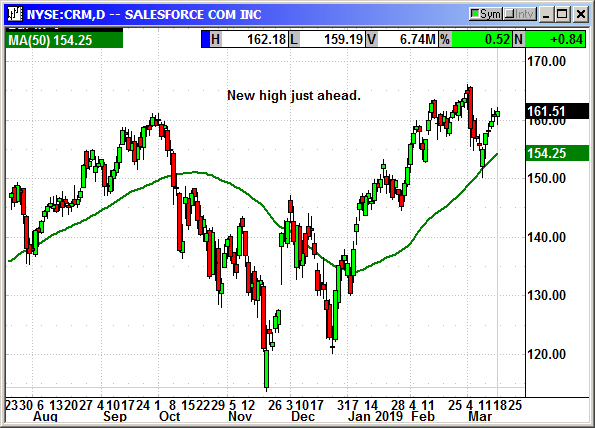 If the Nasdaq is going to retest its highs, SalesForce should make new highs as well. Salesforce.com, Inc. develops enterprise cloud computing solutions with a focus on customer relationship management. The company offers Sales Cloud to store data, monitor leads and progress, forecast opportunities, and gain insights through analytics and relationship intelligence, as well as deliver quotes, contracts, and invoices. It also provides Service Cloud, which enables companies to deliver personalized customer service and support, as well as a field service solution that enables companies to connect agents, dispatchers, and mobile employees through a centralized platform, which helps to schedule and dispatch work, and track and manage jobs in real-time. In addition, the company offers Marketing Cloud to plan, personalize, and optimize one-to-one customer marketing interactions; Commerce Cloud, which enables companies to enhance engagement, conversion, revenue, and loyalty from their customers; and Community Cloud that enables companies to create and manage branded digital destinations for customers, partners, and employees. Further, it provides Quip collaboration platform, which combines documents, spreadsheets, apps, and chat with live CRM data; Salesforce Platform for building enterprise apps, as well as artificial intelligence (AI), no-code, low-code, and code development and integration services, including Trailhead, Einstein AI, Lightning, Internet of Things, Heroku, Analytics, and AppExchange; and solutions for financial services, healthcare, and government. Additionally, the company offers cloud services, such as consulting and implementation services; training services, including instructor-led and online courses; and support and adoption programs. It provides its services through direct sales; and consulting firms, systems integrators, and other partners. salesforce.com, inc. has a partnership with Apple Inc. to develop customer relationship management platform. The company was founded in 1999 and is headquartered in San Francisco, California. Company description from FinViz.com. Shares fell from $165 to $150 after the company reported earnings of 70 cents that beat estimates for 55 cents. Revenue of $3.6 billion beat estimates for $3.56 billion. The problem came on the guidance. They projected earnings of 60-61 cents on $3.67-$3.68 billion. Analysts were expecting 63 cents on $3.69 billion. For the full year the company projected $2.74-$2.76 on a 20% increase in revenue to $15.95-$16.05 billion. Analysts expected $2.75 and $15.97 billion. SalesForce also projected revenue of $26-$28 billion in 2023. The company said it was fighting headwinds because of the strong dollar. However, billings rose 22% to $6.79 billion and beat estimates for $6.43 billion. Their future unearned contract revenue rose 25% to $25.7 billion. This is money that will become due in future months. If a customer signs a 24 month deal for $1,000 a month, SalesForce only gets to count that revenue as it is earned at $1,000 a month. They have $25.7 billion in contracted but unearned revenue. Their RPO, contracted revenue expected to be earned within 12 months, rose 24% to $11.9 billion. They also expect that number to be up 24% at the end of the April quarter. The "SalesForce Platform and Other" segment saw revenue grow 54% to $825 million. Revenue from the EMEA region rose 25%. Revenue from Asia-Pacific rose 25%. Contracts over $20 million rose 48%. There were two deals over $100 million signed last quarter. Yes, shares fell after earnings but who would not want to own a business that is growing this fast? It was just a knee jerk reaction and I wish I had recommended it again the prior week. Buy May $170 call, currently $2.99, stop loss $155.85.